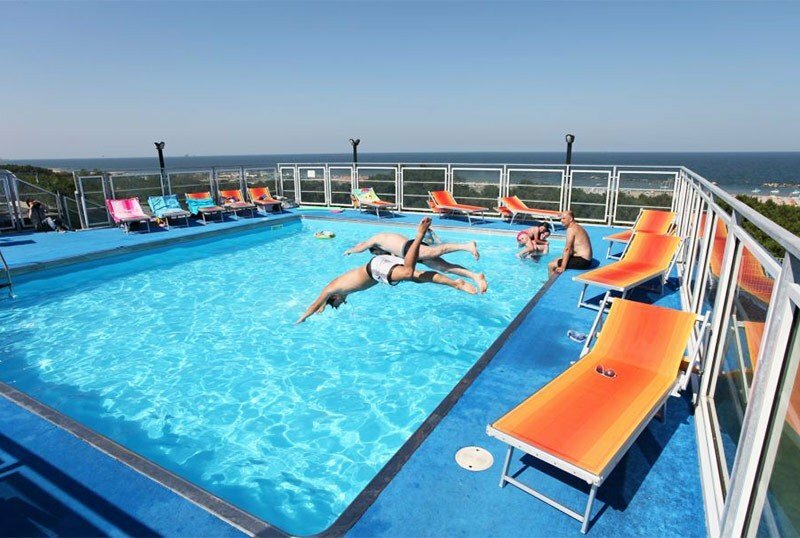 The Hotel Sorriso , a 3 star family run hotel, is located near the sea and a few steps from the center of Lido di Classe. It has a panoramic swimming pool, solarium with playground area and a specialized cuisine for celiacs with a chef entirely dedicated to the preparation of gluten-free dishes. Accept small animals. The hotel overlooks a short stretch of pine grove that separates the structure from the beach, easily reached on foot. Its location is ideal for visiting the amusement parks of the area: The Mirabilandia Park and the Ravenna Zoo Safari are reachable in 10 minutes by car, while the Cervia Spa and the center of Milano Marittima in 15 minutes. All rooms have a balcony, some overlooking the pine grove and the sea, air conditioning, free WI-FI, safe, telephone, minibar, LCD satellite TV and bathroom with hairdryer and shower. Among the new features, 4 exclusive themed rooms: the Sea Room, the Crazy Circus Room, the Jungle Room and the Little Mermaid Room. The theme rooms available are one for each type. FAMILIES: communicating solutions and family rooms for up to 5 people are available. Panoramic swimming pool with solarium and playground area, garden, free bicycles, reading room and two lifts. Organize theme nights. PARKING: free, partly covered and partly uncovered. AIR CONDITIONING: available both in common areas and in rooms without additional costs. CONVENTIONS: beach, amusement parks and waterslide. Possibility of organized excursions. BREAKFAST: large buffet with sweet and savory products. Homemade cakes even without gluten and without milk. LUNCH AND DINNER: table service with 3 first and 3 second courses, fish and dessert every day and a fresh buffet of raw and cooked vegetables. Theme dinners with traditional dishes from Romagna. VARIATIONS: gluten-free menu, children's menu and possibility of lactose-free or vegetarian dishes. OTHER: in case of a trip, customers can ask for a packed lunch with sandwiches, fresh fruit and water. In hotel: swimming pool for children, indoor and outdoor playground area, strollers, baby / mini / junior club, live entertainment and baby sitter service. New: a soft playground area and a nanny are available for children from 1-3 years from 12:30 to 14:00 and from 16:30 to 21:00. Small pharmacy and pediatrician available on request at an extra cost. In the room: cribs and safety rails. At meals: seats at the table, baby menu, baby food and baby food, bottle warmer. On the beach: baby, mini and junior club, live entertainment with creative workshops, twice a week a trip to the nearby waterslide is organized. In the swimming pool: group games, aquagym and free swimming school with the animator lifeguard. The property features a rooftop relaxation area with a rooftop pool and hydromassage, a large solarium, a children's playground area and an inflatable mega. The hotel has an agreement with Bagno 2000, located in front of the structure, which offers a large playground area for children, sports fields for adults, entertainment service that organizes beach volleyball tournaments, beach tennis and beach soccer. Pet equipped area. TOURIST TAX: € 2.00 per day per adult person (from 14 years upwards) for a maximum of 5 days. ALL INCLUSIVE PLUS: All Inclusive (with its services) + Welcome drink + 10 coffees + 5 cocktails at the Hotel bar + 10 drinks (a choice of beer, bitters and grappa) + 1 sea bag with the "Hotel Sorriso" logo . From abroad: BIC / Swift Code: "CRDRIT2FXXX"
The c / c is registered to Hotel Sorriso company: "Zavatta Ubaldo and Giovanna Snc"
- In case of cancellation of the booking within 30 days before the beginning of the stay, the deposit paid will be returned, within 10 days before the deposit can be recovered in another period, in case of lower notice will be retained. Offer below cost with 2 boys for free! Early season offer: 2 kids up to 15 years FREE in a Smile Room with 2 adults! Starting from € 100 per room per day In All Inclusive. Last Minute Easter with children free at Mirabilandia! Last Minute Discounts for the last available rooms! 4 brand new and colorful themed rooms! Sea Room, Little Mermaid, Crazy Circus or Jungle, choose your favorite! Only 1 for type, then hurry up and give a gift to your children. The themed rooms can accommodate up to 4 people.